CHANDLER, Ariz. (BRAIN) — In an effort to get more kids active outdoors this summer, the USA BMX Foundation is promoting a photo scavenger hunt with a prize raffle. 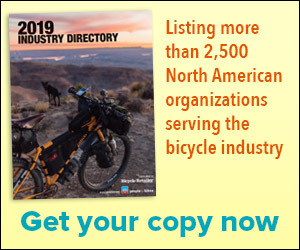 FAIR LAWN, N.J. (BRAIN) — Frog Bikes, a British brand that specializes in offering lightweight kids' road and mountain bikes, has hired Marc Urbanski as its New York, New Jersey and Eastern Pennsylvania representative. FRIEDRICHSHAFEN, Germany (BRAIN) — A total of 1,400 exhibitors and 37,379 industry visitors from 96 countries came to Eurobike this year. Overall industry attendance was down from 42,590 last year, or about 12 percent. BOULDER, Colo. (BRAIN) — PeopleForBikes’ board of directors has elected Quality Bicycle Products founder Steve Flagg board chairman. He will serve a two-year term. FARMINGTON, Utah (BRAIN) — Vista Outdoor has entered an agreement to sell off its Bollé, Cebé and Serengeti brands for $158 million to Antelope Brands Bidco Inc., an entity controlled by a private equity fund based in Europe.